My sister and boyfriend thought we should name her something Oriental sounding but Bizzy just felt like the right name for her. When I saw the picture of Bandit curled up and sleeping, for a moment, I thought you had somehow acquired a picture of my Samson that was floating around in cyberspace and used for your site! I have a picture of him that looks just like that one! My Samson (aka Sammy-boo, aka Samsonite, aka Baby, aka Stinky) is not doing so well. His kidneys are failing and it is likely we will have to put him down in a week. I suspect he knows this. He has been in my lap all evening and following me around everywhere as we try to spend as much time together as we can until it is time for him to go. Among other things, I'm going to miss our lengthy conversations, his desire to be cradled like a baby, resting his head on my shoulder (always the right one, NEVER the left), and his endless supply of love. He's not gone yet and I miss him already. Note from Caroline: I'm so sorry to hear about Samson, Ree. They're like members of the family and it's very hard to let go. I hope in your conversations with him that you've told him all the things you told us above. I have a seal point that I rescued as a kitten two years ago from freezing temperatures. No one claimed him, so I kept him. His name is Blue and has been missing for two days now and I miss his little brown face so much. I've been looking at pics of seal points and saw some that look exactly like him, so this makes me feel a tiny bit better. Come home Blue! Oh yes ... thanks for pointing out the similarity between them, Ellen. I hadn't noticed how alike all three of them looked. Interesting that they're all what I call 'old-fashioned' or Classic Siamese, with the larger body type, too. And both Bizzy and Bandit look very much like my Dax did (see my bead retrieve story). One of the reasons I chose the picture I did (besides lots of red-eyed and flash-eyed photo rejects) is that she was very much in the same sleeping position as Bandit in your page banner, Caroline. 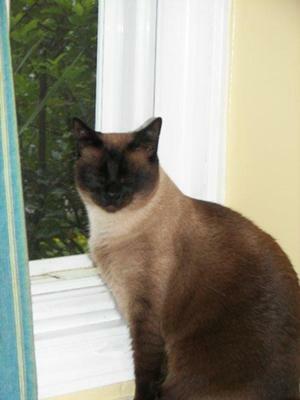 Yes, the cat on the Seal Point page is Bandit too - he was a rescue and you can see more pictures of him on my Siamese Cat Adoption Stories page. There's also another picture of him here. The cat on the Seal Point page looks identical to Bizzy....is that one of yours too? Thanks Meg, for sending in your picture of Bizzy. She's a beautiful Seal Point Siamese - in color she's very like my boy Bandit (that's him in the pictures above) with her brown back, and very dark face and ears. I'll have to let him know he has a Canadian 'sister'! Return to Siamese Cat Names.